This is a Stunning and Beautiful Bertoncello vase made by the Italian pottery circa 1960’s / early 1970’s. An iconic sculptural piece of Retro Italian ceramic design by the famous Bertoncello Ceramiche D’Arte. In their trademark style geometric and monumental and resembling large pebbles / modern architectural forms. With dramatic curves, rounded corners and recessed pierced holes, recalling the works of Henry Moore and Barbara Hepworth. Very Space Age / Op / Pop Art in form with its curved cuboid form, and sits on two shallow pedestal feet so it floats on a surface. 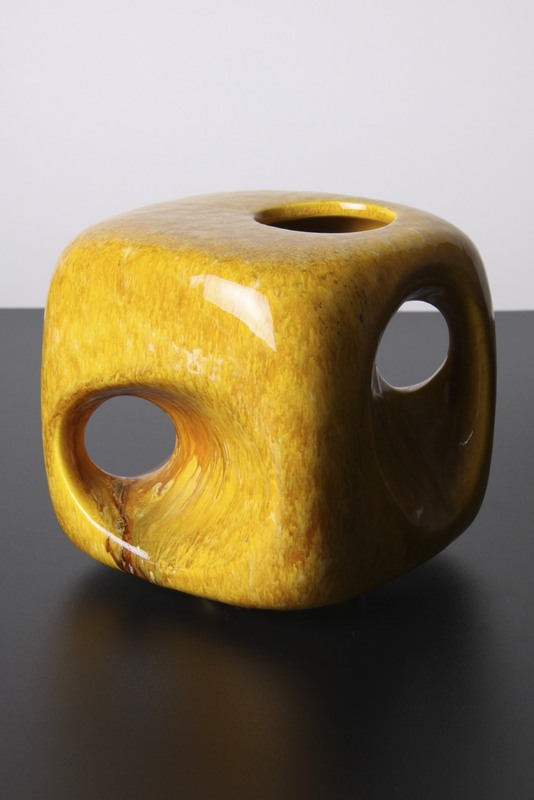 Striking mottled, dripped and streaked glossy yellow and brown tones in the glaze, reminiscent of ‘Fat Lava’ pottery.